Bazaars are hubs of entrepreneurial power in Central Asia, and that power is expressed both formally and informally. By immersing herself in the bazaars of Kyrgyzstan, Regine Spector learned that some are rather best characterized as islands of order in a chaotic national context. Regine Spector is an Associate Professor of Political Science at the University of Massachusetts at Amherst, studying political economy and development. She seeks to understand the creative, contentious, and politically fraught processes that undergird the creation of new market economies in Central Asia. In Order at the Bazaar: Power and Trade in Central Asia (Cornell University Press 2017), Regine Spector provides provides insight into everyday life at bazaars. One of the traders she interviewed, Tatiana, described Dordoi bazaar as a natural water spring that feeds into rivers, a source of growing wealth. How organized are these bazaars, what power do they possess, and how do they contribute to the political economy of Central Asia? As a political economy specialist, how did you come to Central Asian Studies and what does the region bring to the study of political economy? As a graduate student at UC Berkeley, I became inspired by the field of political economy and the importance of studying the interconnections between politics, society, and market relations. It wasn’t something I planned on. I was always very interested in international politics, likely stemming from my own multicultural background. I initially studied European politics in college, in part because I learned German in middle school and high school. In college, I started learning Russian because I realized how limited my understanding of Eastern Europe and the former Soviet Union was after studying abroad in Berlin. As I learned more about this region, I wanted to follow in the footsteps of a new generation of scholars researching the Central Asian countries to better understand massive changes in societies, markets, and economies. Although initially my focus was on cross-border trade, when I started traveling to Central Asia, the variety of understandings of order and disorder among traders captured my attention. How did you choose order as an object of analysis? 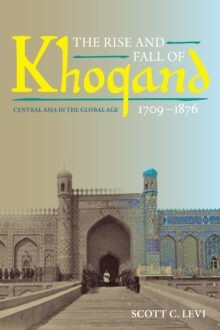 The origins of this focus on order come from both my experience in Central Asia and my engagement with the literature on the region, particularly Kyrgyzstan. A lot of the literature emphasizes disorder and chaos, for example the revolutions and high levels of corruption and political violence that we see in Kyrgyzstan. This includes the loss and dispossession that everyday people faced when the Soviet Union collapsed. Many of these phenomena have increasingly been quantified and classified as part of the new ranking industry that measures the level of political instability or the level of corruption in a given country; these rankings shape investment and aid flows, as well as other policy decisions impacting countries in the region. While in Kyrgyzstan in 2005, the year President Akayev was overthrown, I heard stories about corruption and learned about bribery and other challenges businesses faced. I came to the question of order because amid stories of chaos, I also observed discourses and patterns of order. Some traders seemed to be thriving. People talked about poriadok (order). Because of what I was learning and reading about order, I decided to shift the focus of this book to pay closer attention to how people understand order, and how they practice politics and form political organization to create order. I look at order from the perspectives of traders, owners, and others who work in the country’s bazaars. In your book, you apply the concept of pragmatic forms of agency to political creativity and political formation. How do you see the agency of traders at the bazaar and why is this important? “Pragmatic forms of agency” is important because in some literatures and orientations, one could view traders as not having a lot of choice or agency. The structural context created by the collapse of the Soviet Union in 1991 led to myriad forms of dispossession, including economic loss and separation of families due to migration patterns. For many people, trading was not a choice; it was a necessity, a means of survival. In that sense, people did not have a lot of agency. What I learned from spending time at bazaars and talking to traders is that people, even if they did not choose to trade or would have preferred to return to the professions for which they had trained, sought to create meaningful work environments and to solve problems both collectively and individually. I drew on the literature on political creativity and how people understand and create organizations and institutions based on their own values and ideals. I learned about how they did this through trade unions or other forms of authority. You discuss the Dordoi trade union, a union of traders at Dordoi bazaar in Bishkek. Can you explain more about the union and how it functions? In what ways has the trade union been an effective mechanism for traders to improve their work and lives? It was surprising for me to find a trade union in the bazaar. When we think about bazaars, we think about traders and commodities and the hubbub of economic exchange. I wasn’t expecting to see this form of social and political organization. I learned that many of the traders who were working there, especially during the 1990s and 2000s, were not trained in trade and commerce during the Soviet period. They came from segments of other political and economic classes. They were lawyers, engineers, teachers, or factory workers. During the Soviet period, trade unions existed, for example, to help improve working conditions for people on the shop floor. What was interesting to learn was how traders adapted their Soviet-era understandings to organize the bazaar. They reoriented themselves to this new working context to solve problems they were facing in this work environment. There are now trading starshie, leaders of each trading row, who manage social relations among the traders and serve as points of communication between bazaar administration, bazaar owners, and other traders. They help to resolve disputes about payments, ownership, and other issues. They create community through celebrations and by supporting each other through hard times. They lobby politically, whether to stop state officials from extracting informal payments—what we might call bribes—or to make sure traders pay the formal tax or license fees (patent). They also organize to prevent looting, for example during the political turmoil in the capital in 2005 and 2010. For starshie, order is about standing up for their rights and preventing social conflict, creating community, and trying to instill common norms. I think they have achieved this to some degree. However, trading is still an incredibly difficult job, especially as borders have closed and recessions occurred. Some people still view trading not as a job or profession but as a means of survival, a way to generate income while they attempt to go back to other professions or transition out of the bazaar. I think there are challenges that remain for society as a whole, including widespread poverty and economic crisis, and the lack of other jobs. People feel, especially at smaller regional bazaars, that this is their only means of survival. As a small, land-locked country, Kyrgyzstan is subject to external geopolitical and financial shocks. Whether in the form of changing relations with Russia, border closures, or global economic crises, these shocks directly impact people on the ground, including traders. They do not have a lot of control, so their survival strategy includes adapting. In some cases, they adapt through migration and finding jobs overseas—but as I found, they also adapt by changing the commodity they trade, or their trading patterns. For many, it is a precarious livelihood. However, bigger traders at Dordoi bazaar have done quite well over the years. Some, like Tatiana stated, have used profits to transition out of the bazaar into other services and industries. Tatiana sees Dordoi as a spring that gives life to an entire river. What she means is that many people began to trade at the bazaar, which later enabled them to build new homes or start new businesses. Challenges remain, but bazaar trading is a very important source of employment for people, and it is a central part of the economy in Central Asia. When we think about this region, we often think about gold, oil, or other mining industries. My book shifts the political economy focus to everyday people engaged in trade and commerce. Do you foresee a political class emerging from the creative political actions of people at the bazaar? Union members have lobbied and protested regarding taxation and other government policies. One example I give in the book is an attempt by the government, early in the 2000s, to install cash registers in the bazaars. There were significant protests around that. While some people might say this was simply a way for traders to avoid taxes by keeping the flat combined license/tax, it is also important to consider that the traders have come to view better infrastructure and better working conditions at the bazaar as their due in exchange for payments both to the state and to the bazaar owner. In this process, it became important to study the owner of the bazaar. The trade union and the work of the traders cannot be viewed in isolation. In fact, as I discuss in my book, the main owner of Dordoi bazaar owns the land on which the bazaar rests, and thus charges the traders rent (traders pay a fee to trade on his land). His role in supporting the traders by lobbying municipal officials and other government officials and accessing municipal structures to facilitate a positive trade environment is very important. The bazaar owners are also important in preventing government bureaucrats from extracting bribes from traders. However, the relationship between owners and traders is not always entirely conflict-free. Traders sometimes have issues with the owner over rent policies—for example, how much rent should be and whether rent should keep increasing. These types of negotiations between the owner of the bazaar and the trade union continue as the bazaar changes and the context evolves. The political work of the owner is important to take into consideration; while he cannot control geopolitics, for example, his efforts in supporting and creating order—and a sense of stability—within the country are significant. As you studied trading in Kyrgyzstan, what was the most interesting discovery you made? One of the most interesting dimensions of this research was learning about the different meanings of trading and bazaars and how they changed over time. Initially, there were many stigmas associated with trade. Pre-Soviet stigmas classified trade as not part of the culture or Kyrgyz nomadic tradition and therefore not honorable; Soviet-era stigmas included not only the idea that the reselling of goods was not dignified, but also that it was illegal and even criminal in some cases. While it may not have been people’s choice to trade, traders formed meaningful organizations and associations like the trade union, or else after working in the bazaar for 10-20 years, they came to embody local authority, enabling them to help other traders and resolve conflicts. Soviet-era and pre-Soviet organizational forms and traditions became intertwined in the new market economic context, and for me, the changing understandings that co-constitute these processes were the most interesting to research. At the end of your book, you do a meticulous job of documenting all your interviews and the people you talked to over the course of your fieldwork. As a scholar, why was this important to you? It is important for researchers of any methodological persuasion to be open and forthcoming with how they do their research. As researchers, our positionality and how we access the social world shapes our interpretations of what we see and what we walk away with. The contributions in Ed Schatz’s volume on political ethnography (Political Ethnography: What Immersion Contributes to the Study of Power) make this point powerfully. The unexpected roadblocks, challenges, and opportunities we experience in any field research setting are important components of the research process and should be discussed. My favorite part of research has been meeting people and learning together on the ground. I have sought to seize an opportunity to widen the aperture in political science research to understand everyday life and politics, particularly through economic practices. I am grateful to have got to know so many down-t0-earth and inspiring people along the way, whether traders, other academics at the American University of Central Asia, parents or friends of friends in the region. Learning through their everyday life has been enriching for me. By including a research appendix as well as more ethnographically-inspired research encounters preceding each chapter of the book, I wanted to be really open about the presuppositions with which I came to the research project and how people understood me as an American researcher of part-Asian descent. I decided to include all that as scaffolding so that others who are doing research or reading the book understand how I came my conclusions. I have been working on a series of articles with Aisalkyn Botoeva to better understand the apparel industry in Kyrgyzstan. At the bazaar, especially at Dordoi bazaar, I thought initially that all the goods were from China or Turkey, or else from other foreign countries. But while I was researching bazaars, I learned that there is a booming Made in Kyrgyzstan apparel industry and that some of the goods sold at Dordoi bazaar are produced in the city. Focusing on the shop owners of Made in Kyrgyzstan clothing, Aisalkyn and I have been researching how Bishkek became a sewing hub employing over 100,000 people during the 2000s. How do they get electricity, where did they learn the business of design and apparel manufacturing, and how do they sell pieces abroad? We have focused on the origins, the dynamism, the export-oriented nature of the business, and the increasing challenges—for example, keeping up with rapidly-changing fashion trends. We are thrilled that a few articles on these topics have recently been published in Central Asian Survey, Post-Soviet Affairs, and Review of International Political Economy. What unites this new area of research with my book is an interest in the meanings, practices, and institutions created by everyday people as they engage in what we often study in the social sciences as fundamental political economic processes—including trade and manufacturing. Marintha Miles is a PhD student at George Mason University, where she researches the intersections between society, politics, and religion in Tajikistan. She previously earned a MA in Anthropology from George Washington University.